West 4th/Jane was located on 4th in Santa Monica right next to Harvelle's and across from The Border Grill. The owners named it for an intersection in the West Village in NYC, and there were numerous references to NYC scattered throughout the restaurant. I found it particularly telling that the collage in the men's room contained items from Peter Luger's, The Spotted Pig, and The Corner Bistro--all renowned for their burgers. Note...The Corner Bistro served the most over-rated and over-hyped burger in NYC. The Marinater and I ordered a couple of the Signature Jane Burgers for $13. 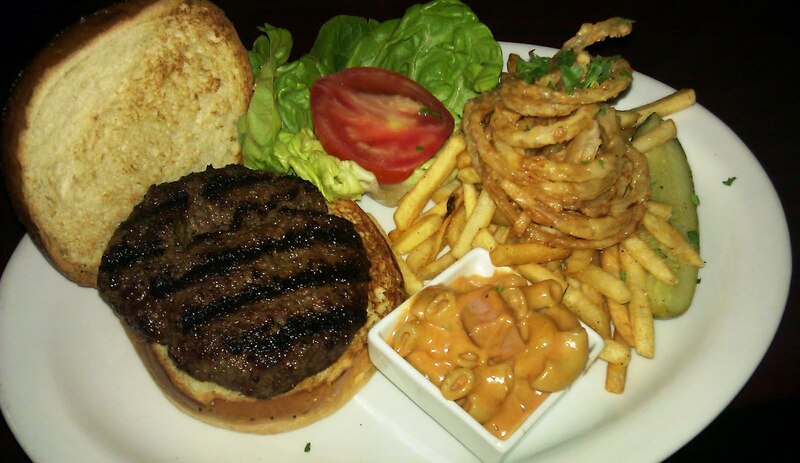 These were the grass-fed, Waygu beef burgers with BBQ mac-n-cheese, and crispy onion rings...served with fries. The wait was about 15 minutes. The Beef: This was 8 ounces of Waygu Round. It was nicely aged. It had strong notes of beef, mineral, and blood. The fine grind caused it to be less juicy than it could have been. The grind also didn't allow the firmness of the cut to come through. Still, the beef was delicious. The Seasoning: The patty was nicely seasoned, and the even saltiness lent the perfect balance to each bite. 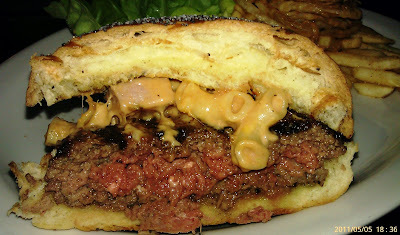 The Sear: The hot, gas grill imparted crisp lines of sear to the patty and also added just the right amount of char. The sear was surprisingly good for a gas grill. The Preparation: West 4th/Jane delivered a solid Med-Rare as requested. 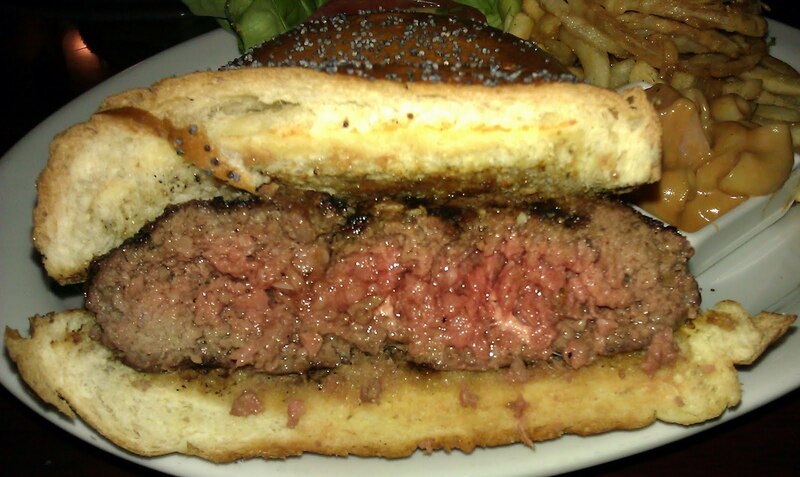 The thick patties were formed firmly, but they were not over-manipulated to the point of becoming chewy. The Cheese: Hmmm....They used a BBQ Mac and Cheese with ham. It was sweet and not cheesy. The tender macaroni did not blend with the bite. Frankly, this made a fine side dish, but it was not a good burger topping. A much more savory and gooey rendition was called for. I tried this on half the burger, and I enjoyed the half without this topping far more. This beef did not need cheese. The flavorful beef stood alone. The Bun: This was a nicely toasted, poppy-seeded brioche from Rockenwagner. The bun was completely competent and invisible. The beef, seasoning, char, and crispy sear were enough for the palate to work with. The bun did its job without pulling focus. The Fries: These were thin, crisp, well-seasoned, shoestring fries. These were fine, but after a 1/2 pound burger, I had no interest in fries. The Toppings: The Roma Tomato and Butter Leaf Lettuce were both fresh and flavorful. The crispy onion rings were sweet and light. These rings coupled with the sweet mac and cheese resulted in too much sweet on a savory, beefy burger--have the rings on the side. The Value: It was 13 bucks, but that was for a belt-loosening 1/2 pound of Waygu beef, toppings, and fries. The value was fine. I recommend the burger at West 4th/Jane, but I recommend it with the toppings on the side. Burger Review : That was a tasty burger. My friend got violently ill with food poisoning after eating a burger here last night.